Summer vacation is coming to an end for some kids, and the new school year begins in few days. I had a chance to spend couple days at home with my grandchildren, since most of the summer they were busy attending various camps. I will not be posting any recipes, but will share with you some pictures of the finished products. 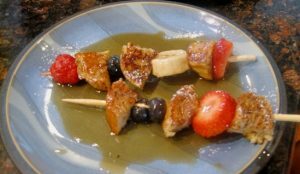 French Toast and Fresh Fruit on a stick, was our breakfast on the first day. 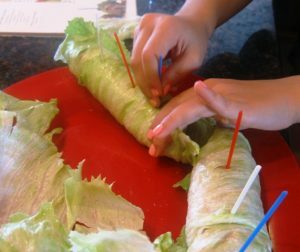 They had fun taking turns with cracking the eggs, and dipping the sliced French Baguette in it…I helped with cooking it. They enjoyed this dish with Maple Syrup and Powdered Sugar…and a glass of milk. It looks yummy, and it sure was. 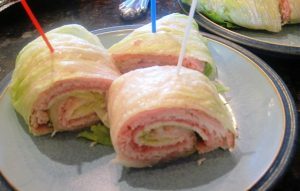 This was our lunch – Turkey and Cheese, or Ham and Cheese Lettuce Wraps. 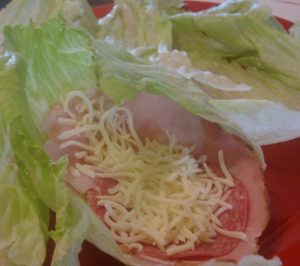 My grandson also added some Genoa Salami to his. I think they enjoyed making these as much as eating them. They did a great job! 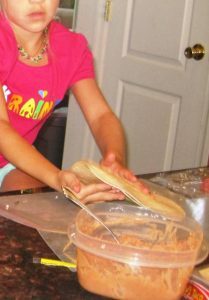 Handling Quesadillas was a little tricky….making sure the ingredients did not fall out while transferring them onto a frying pan. Each Quesadilla consisted of Refried Bean and Monterey Jack cheese, but we also made some with cubed ham, or turkey. Here is the finished product, ready to enjoy. 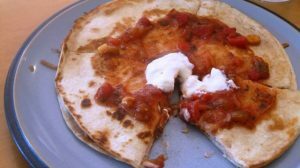 Some of us had it plain, others added Salsa and Sour Cream, to please their taste buds. 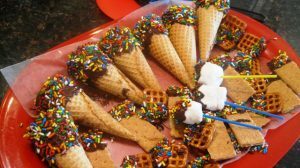 Dessert was the most fun to prepare, and to serve. 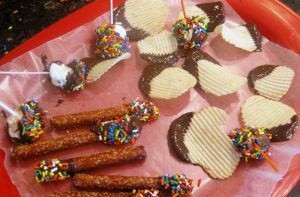 My granddaughter wanted to please her mom’s love of chocolate, so she selected this all chocolate dipping variation, as you see pictured above. Almost forgot to mention that my granddaughter made place cards for everyone. 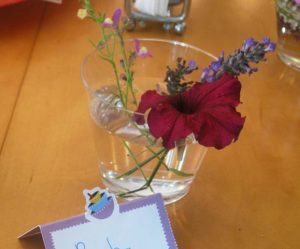 She also created individual centerpieces, crafted from clear plastic cups, and flowers she picked in her mom’s flower garden. So special and festive. The next day we made pancakes for breakfast, sliders for lunch, and in the afternoon we were busy making snacks. 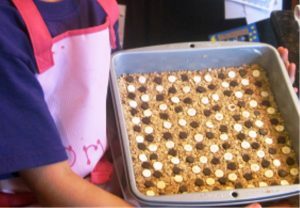 This is a homemade granola, sweetened by honey, and studded with dark and white chocolate chips. 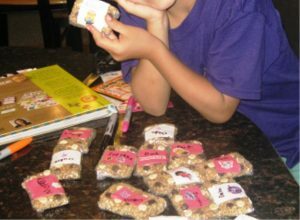 We cut them into small serving bars, and wrapped each with Saran wrap. 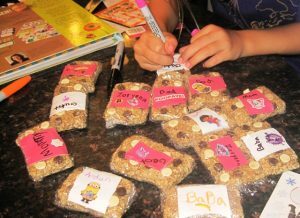 She personalized them with everyone’s name, and decorated each with stickers. 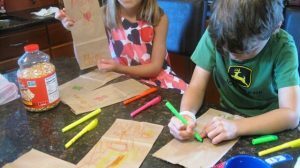 Since the next day was their traditional “Family Movie Night”, they decided to prepare special popcorn bags, to have them ready for popping, before the movie. 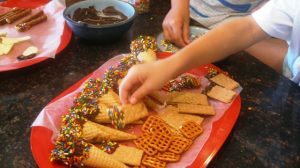 I would love to hear from other grandparents, parents, or babysitters, about their fun with cooking and crafting with children. with the young, but this time we do not have the same pressures as when we were raising our own children. Thank you so much for being such a loyal follower of my blog. I totally agree that becoming grandparents is a true gift from God, and an enjoyable experience being part of their life, watching them grow and accomplish their numerous milestones. I will send you the granola bar recipe.